Melasma is a common skin disorder that affects millions of people in the U.S and around the world. As a matter of fact, 90% of those affected are women, as per the American Academy of Dermatology. This skin disorder is often associated with prolonged exposure to sun, but it is also common in pregnant women. Hence, it is nicknamed the “mask of pregnancy.” Some of the other common triggers for this condition include birth control pills and estrogen supplements. Patients should consult a dermatologist before trying any home remedies for Melasma. Some home remedies and over-the-counter treatments involve chemicals that could aggravate the skin and make the condition worse. The good news is that technology is evolving to better treat Melasma. Fraxel laser for melasma is a tool that is increasingly used for treating the disorder, particularly in severe cases and cases that don’t respond to other treatments. Fraxel laser treatment for melasma received new FDA approval in June 2013. Most often, Melasma affects young women with a brownish skin tone. It is characterized by skin discoloration, usually located on areas of the body that are more exposed to the sun. This includes the forehead, cheeks, nose, and chin. There are several treatment alternatives to help manage Melasma. 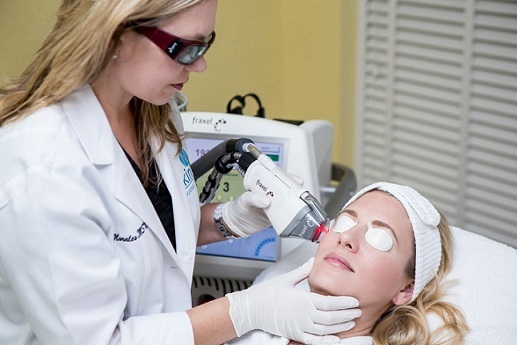 Doctors and dermatologists are excited about the FDA approval of laser for melasma treatment. Besides improving skin texture and unevenness, laser toning melasma even reduces pore size. Using a broad spectrum sunscreen is the first line of defense. It helps prevent further skin discoloration. When a patient is watchful about the use of sunscreen and avoids prolonged sun exposure, the condition will often improve spontaneously. More importantly, it helps prevent further discoloration. One of the first lines of treatments is the use of hydroquinone cream, gel or lotion to lighten the skin. This cream is available on prescription and over-the-counter. The dermatologist may even prescribe other topical medicines to help lighten the skin. This includes Tretinoin (Retin A), Azelaic acid, corticosteroids and Kojic acid. Many new products have been developed without hydroquinone cream for treating the disorder. Treatments for Melasma include microdermabrasion (non invasive treatment that exfoliates skin), chemical peels, and laser treatment with Fraxel, Ruby and Q-switched Nd-YAG lasers. A final option is the combination of several of the aforementioned treatments. In a recent study, researchers found that microdermabrasion and laser treatment used in combination can be a safe and non-invasive approach, with little or no recovery time, and have long lasting effects. To prevent Melasma, it is important to avoid prolonged exposure to sunlight. Everyone should apply sunscreen 20 minutes prior to stepping out in the sun. This is particularly important for people looking to minimize Melasma. In addition, efforts to reduce sun exposure, like wearing a wide-brimmed hat and sunglasses, can also prove helpful in the prevention of this skin disorder. Melasma rarely fades on its own. People prefer to treat it because it’s unsightly and causes some degree of embarrassment. Appropriate treatment and preventive measures can significantly improve quality of life and help restore self-confidence.